Azure Web Apps or App Services are quite flexible regarding deployment. You can deploy via FTP, OneDrive or Dropbox, different cloud-based source controls like VSTS, GitHub, or BitBucket, your on-premise Git, multiples IDEs including Visual Studio, Eclipse and Xcode, and using MSBuild via Web Deploy or FTP/FTPs. And this list is very likely to keep expanding. However, there might be some scenarios where you just need to update some reference files and don’t need to build or update the whole solution. Additionally, it’s quite common that corporate firewalls restrictions leave you with only the HTTP or HTTPs ports open to interact with your Azure App Service. I had such a scenario where we had to automate the deployment of new public keys to an Azure App Service to support client certificate-based authentication. However, we were restricted by policies and firewalls. The Kudu REST API provides a lot of handy features which support Azure App Services source code management and deployments operations, among others. One of these is the Virtual File System (VFS) API. This API is based on the VFS HTTP Adapter which wraps a VFS instance as an HTTP RESTful interface. The Kudu VFS API allows us to upload and download files, get a list of files in a directory, create directories, and delete files from the virtual file system of an Azure App Service; and we can use PowerShell to call it. 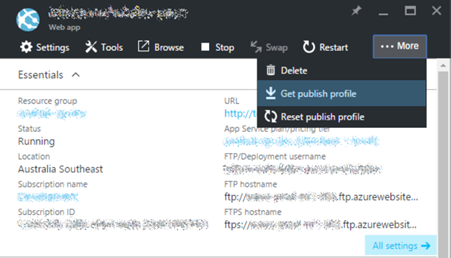 In this post I will show how to interact with the Azure App Service Virtual File Sytem (VFS) API via PowerShell. Authenticating to the Kudu API. To call any of the Kudu APIs, we need to authenticate by adding the corresponding Authorization header. To create the header value, we need to use the Kudu API credentials, as detailed here. Because we will be interacting with an API related to an App Service, we will be using site-level credentials (a.k.a. publishing profile credentials). We can also get the site-level credentials via PowerShell. I’ve created a PowerShell function which returns the publishing credentials of an Azure App Service or a Deployment Slot, as shown below. To invoke the REST API operation via PowerShell we will use the Invoke-RestMethod cmdlet. We have to bear in mind that when trying to overwrite or delete a file, the web server implements ETag behaviour to identify specific versions of files. I have created the PowerShell function shown below which uploads a local file to a path in the virtual file system. To call this function you need to provide the App Service name, the Kudu credentials (username and password), the local path of your file and the kudu path. The function assumes that you want to upload the file under the wwwroot folder, but you can change it if needed. As you can see in the script, we are adding the “If-Match”=”*” header to disable ETag version check on the server side. Similarly, I have created a function to download a file on an App Service to the local file system via PowerShell. In addition to using the VFS API, we can also use the Kudu ZIP Api, which allows to upload zip files and expand them into folders, and compress server folders as zip files and download them. You could create your own PowerShell functions to interact with the ZIP API based on what we have previously shown. As we have seen, in addition to the multiple deployment options we have for Azure App Services, we can also use the Kudu VFS API to interact with the App Service Virtual File System via HTTP. I have shared some functions for some of the provided operations. You could customise these functions or create your own based on your needs. I noticed in Web test result panel that it always redirects to login portal and give success response all the time. How I can add credentials to my Web Test URL? Can you please assist on this step by step?, Thanks. Great post has helped a great deal. Just a small issue that one of your function is named wrong? you have a script for a function Get-KuduApiAuthorisationHeaderValue but when you use it you specify Get-KuduApiAuthorisationToken but with username and password,which don’t need specifying, not resourcegroup and webappname ? Great article, it really helped me. One question, If I try upload a file to a slot that is stopped, I get “Error 403 – This web app is stopped”. Is there any way I can copy files to a staging slot? This is just the one i was looking for the, great article but small issue though what would pass for kudupath ? All working perfectly now. I have to specify the downloading file with the extension.